The SST Pivot Disc is placed on the floor with the label facing downwards. The individual's feet are positioned completely on the disc to facilitate a smooth transfer and reduce back strain on both the individual and caregiver. The handle of the Pivot Disc should be place facing the individual to prevent interfering with the caregivers feet. 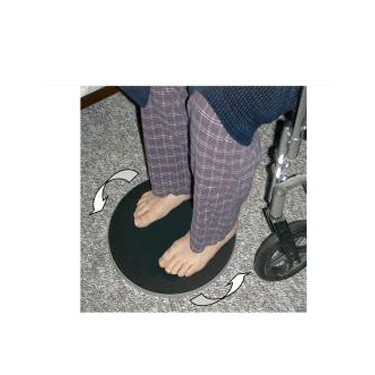 The caregiver should place one foot on the Pivot Disc to safely monitor and control the transfer. After using the Pivot Disc, it should be immediately removed from the floor. Good for turning when legs aren't working well. Pros:Turns safely with help from others or by myself on good days. Transfer turns without moving legs. Helps greatly with car transfers and pivoting from wheel chair to toilet with grab bars. Cons:Hard to manage if not standing up well, weak times need help to turn myself, and trouble turning walker with disc while balancing with walker. Harder to turn on thick carpet. My uncle is too heavy so this helped to get him out of bed to a wheel chair. Pros:It lets the patient not have to move their feet when moving them from the bed to the wheelchair. Cons:I got the biggest Pivot Disc and it is a little heavy to get in place but it works good. Pros:light easy to place and use. I store it in the pouch in back of my wife's wheel chair. Cons:needs a little more gripping on the bottom have had it to slide a little once or twice. This is an amazing product. We found out about through my mom's PT. I recommend it to anyone who needs transfers and who can stand.